I want to share a story about kindness and community. Topics that, too often, go unmentioned. One year ago, LiveGirl was just a seed of an idea for a one-week summer camp that would make a small difference. It has since grown into an organization that provides year-round programming, making a big difference, for over 100 middle school girls across Fairfield County. Our focus is on leadership, empowerment and diversity so that the young girls of our community are more confident and better prepared for the future. This was made possible by the kindness and generous contributions of many people. Like Meg Domino, the Executive Director of New Canaan CARES, who serves on the LiveGirl Board of Directors, and is our Yoda and guiding force. And David Hoyle, a Partner at Hawthorne, Ackerly & Dorrance, LLC, who was inspired upon hearing about the organization and, pro bono, handled the entire incorporation process, paving the way for our tax-exempt status. And Andrea Chalon, whose beautiful photos have helped communicate our story. And the New Canaan families who have opened their hearts and made free programming possible to the neighboring girls in Bridgeport, Norwalk and Stamford. It is an inspiring story that speaks volumes about the character and people of New Canaan. Our community has fostered the LiveGirl community. Thank you. Founder & Executive Director, LiveGirl, Inc.
P.S. 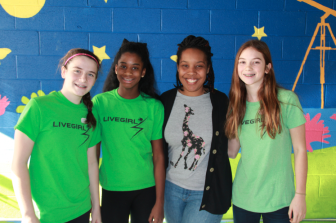 Registration is now open for Camp LiveGirl, July 25-29, at New Canaan High School for girls in current grades 5-8. Space is limited.